A kettle can be looked at much like the cauldron, a goddess symbol with connections to both Earth and Water elements. The above quote is from Juniper on one of the tools of hearth craft. This idea really resonates with me and I’m amazed that I didn’t make that connection before. Sure, I see my apartment’s electric stove as the modern hearth and the heat it produces as an extension of Brighid’s sacred flame – but why didn’t I ever see my kettle as a type of cauldron? As a tea lover, it is such a central part of my life! I think my world was just rocked. I love working in my kitchen. When I’m there, I feel close to Brighid, my patroness and guardian of the hearth. Over the years, I’ve turned into a real foodie. I love making my own food. If I can grow it, that’s even better! The kitchen is a great place to adopt a more sustainable lifestyle. Although we’re not perfect, Weretoad and I have been making considerable efforts! I was really, really pleased to get a food dehydrator as a holiday gift from my parents. 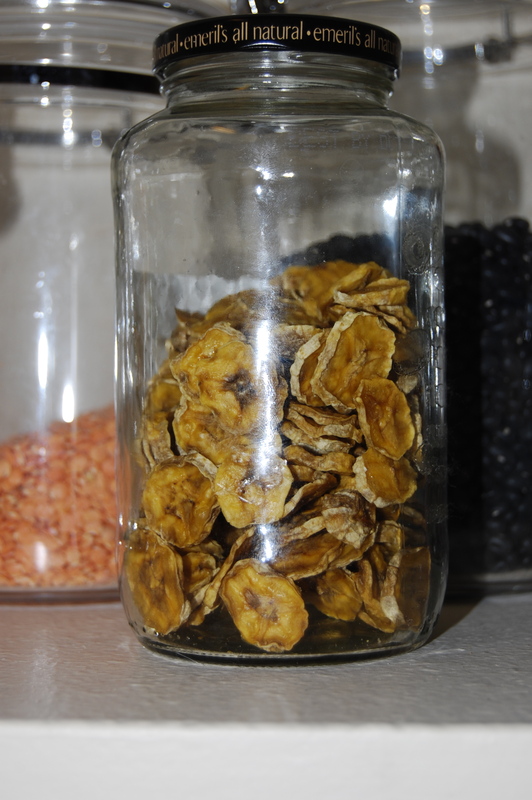 Drying is one of the oldest forms of food preservation. I’ve been doing a bit myself the old fashioned way – mostly with herbs and chili peppers from my garden. This new dehydrator will allow me to dry larger quantities of food quickly and using very little energy. Last night we dried two bunches of mini bananas that were on their way out and dirt cheap at the grocery store. Sure they’re not local. They weren’t organic either. But using old bananas that would have been thrown out anyway is very sustainable! They are so delicious too. They aren’t like the typical banana chips bought in stores, which are usually fried before drying. These are chewy like a gummy candy! 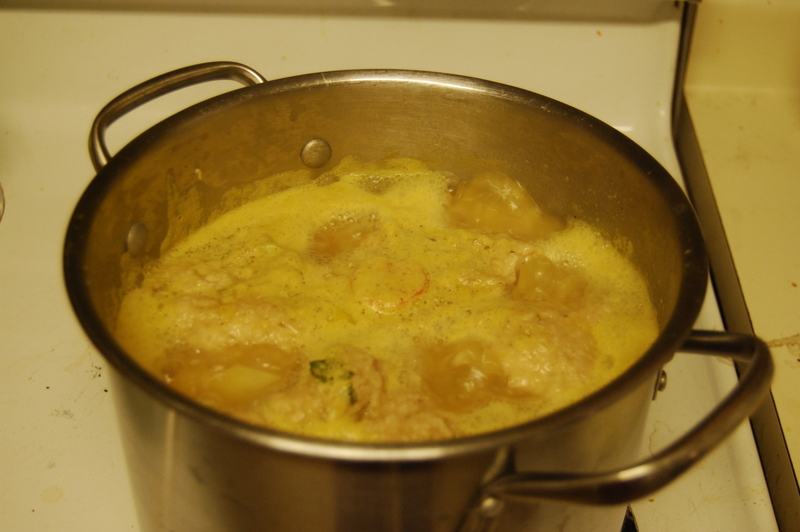 As I write this, I’m making tonight’s dinner – stew and dumplings thanks to my father’s dumpling recipe. A few years ago, I was more likely to make some sort of vegetarian hamburger helper type meal – something from a package. To a busy gal more focused on literature than food, they seemed healthy. As I’ve grown, I’ve become more interested in what is on my plate. Where did it come from? What’s in it? Is it really good for me? Again, we’re not perfect, but we’ve made huge strides in making a majority of our meals from scratch or from local/organic products. Making food in the traditional way, I feel, brings me closer to the Kindreds. Working in the kitchen, as I said, strengthens my relationship to Brighid of the hearth. Using better ingredients brings me closer to the Nature Spirits. Preparing meals from scratch rather than from a box and becoming more and more familiar with traditional methods brings me closer to my ancestors. We don’t feel that we’re perfect (we have lazy moments) and our journey towards better sustainability continues. It is a very Druidic journey, in my opinion. Witches and Druids who strive for a closeness with the Earth should take such a journey. Some of you may disagree with me, but it’s something I believe very strongly. Ireland has captured my imagination, for better or for worse. A few years earlier, I never would have believed that I would be seriously studying Irish lore, Irish history, considering learning the Irish language, and worshiping the Irish Gods. A few years ago, the Irish Gods were “the strange Gods with even stranger names.” In a society that seems to idolize the Greeks and Romans, we’re just more familiar with their mythology and history. As a fledgling Pagan, I really tried to make those cultures central to my worship. In the end, Ireland finally got the attention I now realize it was trying to get all along. It isn’t that I hated Ireland as a younger me. In fact, I was very much enamored with anything medieval, and Ireland started to attract me then. In middle school I went through a phase where I had to read about medieval castles, swords, history, and clothing. I was obsessed with the legend of King Arthur and Merlin. Above all, I was captivated by Irish music, especially harp music. Upon finding ADF I felt like I was already feeling a call from the Tuatha de Danann. I wasn’t sure what to do with this calling, but ADF gave me helpful hints and I began to read voraciously about Ireland. My interest in medieval culture came back, along with an even greater interest in Ancient Ireland. At first, the books I read were confusing. Again, I was dealing with “those strange Gods with the even stranger names.” As I went along, I soon realized that I was growing more and more familiar, and thus comfortable, with the culture and the Gods. I first realized how akin the old Irish ideas about the world were to my own. The Irish respected and even venerated nature as do I. They didn’t see a separation of the mundane and the magical/spiritual, and nor do I. The old Irish were polytheistic and so am I. They felt that art, knowledge, and truth were some of the most important and powerful things, and so do I. Yet there was more than that. Something just clicked. Before I knew it, the ADF rituals started to make sense. When I first attended a grove, although it was a lovely experience, I was reminded of long, Catholic masses full of mystery. Through studying the lore and history, I realized that there was a pattern being followed. 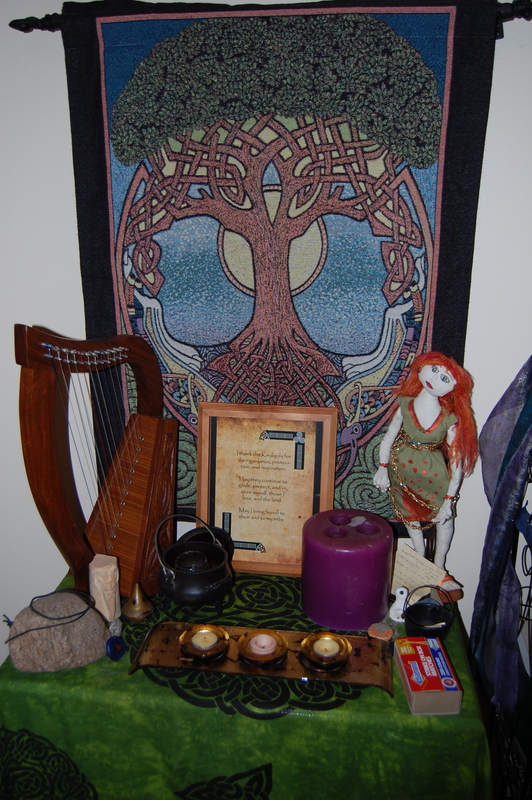 I started to understand Gatekeepers, the three realms, the three Kindreds, and so many other theological subjects within ADF through a Celtic, especially Irish, frame of mind. Somehow, during the voracious reading I was doing, I started to internalize the culture bit by bit. I found that I believed in the Otherworld, fairies, and even found myself a bit fearful of the Pooka around Samhain. I pray to the Gods and thank them often. Slowly but surely, Irish concepts are leaking into my art. I’ve been sewing dolls that resemble the Tuatha de Danann and incorporating spirals into my projects. The number three has become very important to me. I don’t feel like I forced myself to think in this way – I believe that it happened slowly and over time. I know I will never actually be Irish, but I think it’s important to have a good grasp of a pantheon’s culture, and through the study of said culture, I find myself adopting its ways, however small. I intend to continue my Irish cultural studies and I’m sure that, by doing so, my perception of the world will shift even more. Academics aside, I do put a lot of effort into spiritual practice as well. I try to meditate as often as possible. It’s sometimes difficult to make the time, but when I do it is very relaxing and refreshing. I am hoping to study trance in the near future. I thank the Three Kindreds for their guidance, protection, blessings, and inspiration. And may I honor them with all I say and do. And I thank the plants and animals that had to die so that I could live. Aside from my bedroom altar, there are also a couple of shrines I’ve set up outside. One is right outside the door. Using a pot, soil, and a fairy statue, I created a shrine for the house spirit. 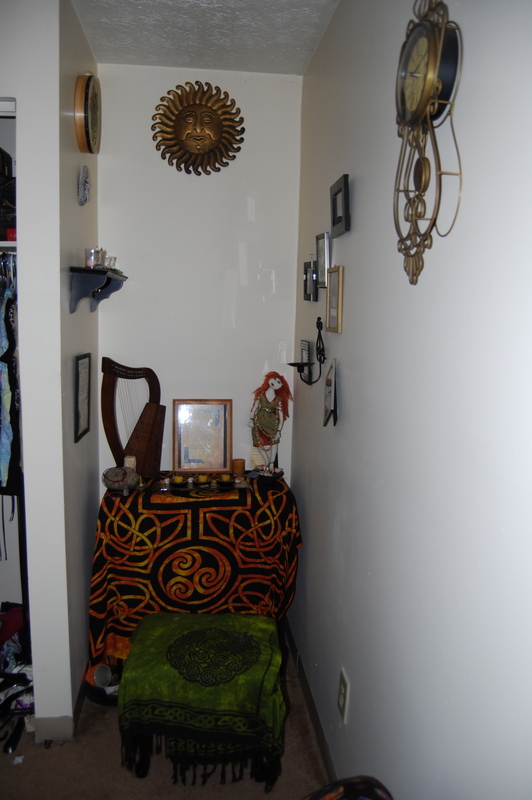 I felt that it was important for her shrine to be situated in a threshold of sorts because I see her as both a protector of the indoors and the outdoors around my home. I always acknowledge her as I enter and exit my home. I sometimes leave offerings of flowers, petals, stones, or other such things. Further back, as you walk into the forest behind my home, there is another shrine I set up. I like to give offerings to the Kindreds there, and I feel that it is an especially sacred spot because once, while meditating under that tree, I opened my eyes to see a whole herd of deer standing around me. It was truly amazing and I felt that the ground was sacred because of that experience. However, due to the leafy and uneven consistency of the forest floor, I generally don’t do my full rituals there because a flame of any sort would seem dangerous. I tend to perform outside rituals by my garden under an oak tree using a candle to represent the fire. Luckily, there are a few groves in Upstate NY. As of yet, there isn’t one in my hometown of Utica, but I started to visit Muin Mound in Syracuse. I felt immediately welcomed there. They tend to perform Celtic rituals for Samhain, Imbolc, Beltaine, and Lughnasadh, and Norse rituals for the Solstices and Equinoxes. This is interesting for me because I get to learn about another culture besides my own. The experiences with them have helped solidify a lot of my thoughts on ADF. Seeing an ADF ritual performed is more helpful to me than reading about one. It’s helped me to become more familiar and comfortable with the liturgy. So much so, in fact, that I’ve lead two Druidic rituals for the local Pagan alliance in Utica – one for Imbolc and one for Beltaine. While I was nervous about them, they were successful and well-received. I now feel a calling to become a clergy member within ADF and serve my local Pagan community. This calling has grown especially strong now that I know there are at least three other ADF members in Utica who would love to see a grove form. In the meantime, I’ve helped to organize a study group with the other local ADF members. We are just starting out, but I hope to see it evolve. In the meantime, it is a place to discuss our spirituality with likeminded individuals. I hope that we can begin performing some rituals, but at the same time, I hope to continue visiting Muin Mound and other groves to keep things fresh and to help inspire me. I feel very comfortable with my hearth culture. My world is now full of spirals, Gods, and hidden places of power, and I feel very connected to some of my ancestors. That is… some. While I feel very at home with the Tuatha de Dannan and my Irish hearth culture, my ancestry is not just Celtic but also Germanic. There are times when I feel little tugs from Norse Gods, like Thor, and I feel that it is because I’m ignoring a part of my genes. Here and there, I’ve picked up a book on Germanic culture and lore. I hope to one day figure out how to balance between these two hearth cultures. It will take some time, study, and practice, but I’m sure that I will be able to do it. As I near completing my Dedicant Program I look forward to the future and what it brings to my soul. I can see myself serving my community, growing as an artist through spirituality, learning more and more about the world around me, growing more adept at meditation, and learning Irish. I hope that I am one day able to help lead a nemeton and provide guidance for future Druids. ADF has given me reason to want to serve the Pagan community at large rather than just myself.